Beko washing machines last forever, can't go wrong with one of these. They are less complicated to work out with the dials as most washing .machines confuse me just looking at them (Its not hard to confuse me though aha) you can get a nice load in with these machines, they wash clothes very well! Have had this fridge freezer for several years now and never let me down plenty of room drinks cooler in door is excellent for ice cold drinks on tap would highly recommend this product to anyone looking for new fridge freezer. I love my beko fridge, i have found the produce last a bit longer since i have had it which really helps. Got all our appliances in Beko and they are good quality. I have a great Beko washing machine. Stylish and does a great job. I have a beko washer and also a beko fridge not had any problems with either as of yet. 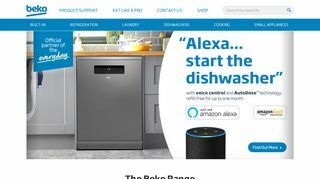 Beko do good quality reliable kitchen items such as fridges, freezers, dishwashers , cookers etc they all come with long warranties.